This was our contribution to the Ely District Quarter Peal month in memory of Rosemary Palmer and Colin Johnson. Here is a photo of the event (click on the photo to see a larger version). The 1260 changes were made up from Chiming, Rounds and Call Changes, Plain Hunt and Stedman Singles on the tower bells and, on handbells, Rounds and Named Changes, Plain Hunt on 6 and Plain Bob Minor. 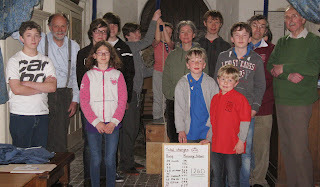 The Young Ringers were: Kieran Edney, William Johnson, Jessica Feetenby, Melanie Franks, Chris Franks, Joshua Brown, Daniel Smith, Zachary Brown, Reece Perry, Jason Burnet, Jacob Childs. And the helpers were: Chris Bell, Barbara Le Gallez, Marina Warner, Nicholas Small. Alan Winter. In memory of Rosemary Palmer and Colin Johnson, as part of the Ely District 'Ring for Rosemary and Colin' month.